July 2011. The Dude is seven. 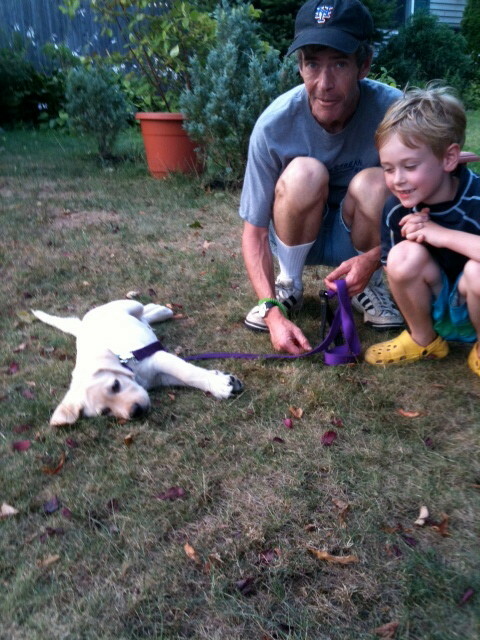 Mookie is about ten weeks. Me? 48. Most of this is a re-run for some of you. Heck, it’s August. Read it again. Why not. Back in the Summer of 2011, my buddy David Sabatino, aka Mr. Valley Stream Himself, suggested that I write something for the Valley Stream Voices column in the local Herald Newspaper. And I said, yeah, I could do that. David was helping out the editor at the time, Andrew Hackmack, who did a great job covering the town for a lot of years. Andrew asked him to find someone who could do a Voices column, and David said, “John Duffy.” And I’m glad he did. I decided to try to capture the experience of raising a child in the same town I grew up in. I painted the place in a very positive light, and overall, I was happy with the way it came out. Andrew wrote the headline, “Valley Stream is Better Than Ever,” which was not totally misleading, as it was the general theme of the essay, but I thought it that message was a little too advertising slogan-y. Life is pain, your highness. Anyone who tells you differently is selling you something. There are a lot of things that aren’t better: First and foremost that we’re all packed in like sardines, and they keep building more and higher sardine cans to pack more people in. There happens to be a reason for that. At some point, the Long Island Rail Road, which my wife Trisha subjects herself to twice a day to earn a living, is eventually going to finish a connection to Grand Central Station and the East Side of Manhattan. And when that day comes, lots more people are apparently going to want to live in apartment buildings near the railroad stations, specifically Valley Stream and Gibson. And I suppose the ten minutes it takes me to go two miles to the King Kullen some afternoons will turn into fifteen. They built a monster of an apartment building less than a mile from Duffy’s Creek – called Sun Valley Apartments. Ugh. – that I and many people raised hell about when it went up, because it looked like a cross between a Bronx tenement and an upstate prison. They recently did a nice crown molding all the way around the top of it to make it less ugly. That was nice of them. Anyway, here we are, and what follows is my little public love letter to Valley Stream, written four years ago. My favorite thing about this essay is that the mayor of Valley Stream, a very smart, energetic and friendly fellow named Edwin Fare (that’s right, Mayor Fare) has borrowed a phrase that was the anchor of the whole piece. I don’t know how terribly original it was, but I referred to Valley Stream as a “big small town”, which it is if you’re an old timer. You’re usually about three degrees of separation from anyone you start a conversation with – they went to school with someone you know, or lived on the same street, or went to the same church, or played on the same team, or at the very least got drunk in the same bar. Mayor Fare used the phrase in an interview with Newsday and in a recent Cablevision-produced video. I believe that he unconsciously lifted it from me. I saw him just today walking around the pool. I’ve never said to him, “Hey! That’s my line!”, since for one thing what does it matter and for another thing he’d just tell me it isn’t, ’cause he took it. Fact is, he needs it more than I do. (What I did say to him was, “you ought to jump in! It’s like a bathtub in there today!” Which was just me being folksy, as he was wearing street clothes). I am a second-generation Valley Streamer. Many of you just said, “me, too!” There are a lot of us. My parents moved from Queens in 1955 for a backyard on a creek and room for their growing family. Five kids and 46 years later, in 2001, they moved east and my wife and I bought the house where I grew up. Two years later, in my 40th year, our son Jack was born, a third-generation Valley Streamer. In my new role as Jack’s daddy, I began to realize how many of the icons of my childhood were unchanged, and how Valley Stream remains a big small town and a good place to grow up. In my opinion, it’s actually better than in the ’60s and ’70s. When I was a kid, my mother might announce that we were “going to town.” That meant driving in our red Volkswagon bus (seriously, we had one) over to Rockaway Avenue. 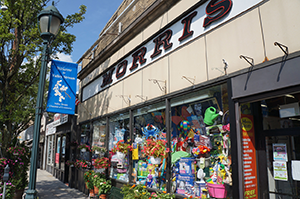 The first stop was Morris Variety, then, as now, a place where a little kid could be enraptured by the impressive assortment of stuff; where you could get lost in the long aisles of toys, hardware and craft supplies while mom picked through greeting cards, then memorize the candy at the front counter while she checked out. Going to town might also include lunch at Itgen’s, Mitchell’s or Ancona, and maybe a walk up to Sal and Vin’s for haircuts, a swing by the library or a stop at the bank with the big vault that looked like the one Maxwell Smart walked through. 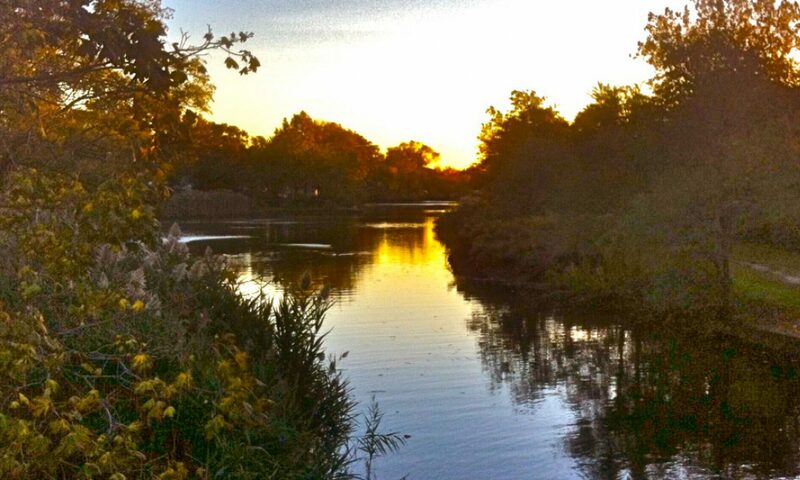 One of the first places Jack and I went when he was a baby was Brook Road Park in Mill Brook. (Sorry, but it’ll always be Green Acres to me.) When my older siblings were all in school and I was home with my mother, she would push me there in a stroller over the bridge. (The bridge was first fenced off and then taken down, to the dismay of many old-timers.) Coming back 40 years later with my little boy was one of my first trips into my personal Valley Stream Time Machine, one of many enjoyable travels that I’ve taken back to my childhood through my son. After admiring the new playground equipment, we walked by a fence that holds back the eroding retaining wall along the creek. Behind the fence were relics of my pre-school days — the big dolphin you could sit on, and the concrete turtle you could crawl under, both on a bouncy rubber surface. And there was the very bench where my mother sat enjoying my company, wearing ’60s-style cat’s-eye glasses. As Jack grew into a toddler, we joined the Valley Stream Pool. As a kid, I remember the kiddie pool area shaded by mottled Sycamore trees, like the ones still in the playground. My mother was a part of a group of women with lots of children who jokingly called themselves the “Over the Hill, Under the Tree Club.” On summer days, they could have some much-needed peace and adult conversation as the kids entertained themselves. There was a probably a 30-year interval between my last visit to the pool as a kid and my first as a dad. 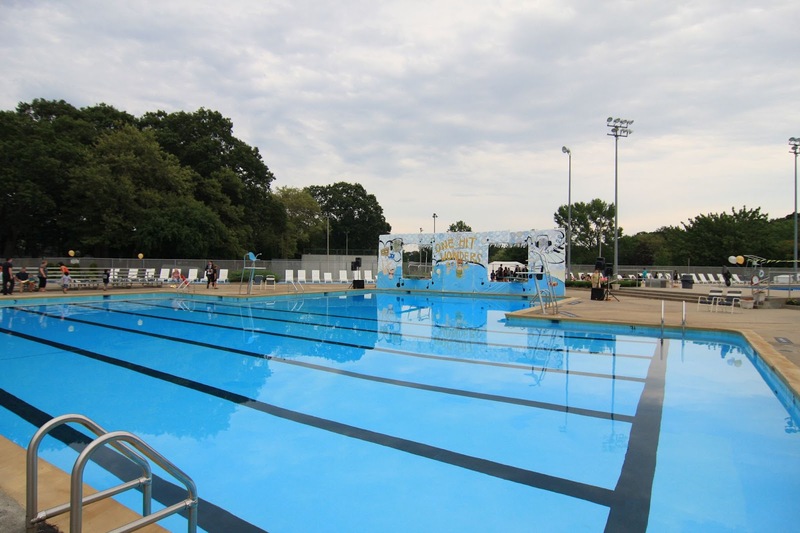 As I stood next to the Olympic pool, “Whoosh!” I was in the time machine again — going under water with my eyes open, daring myself out into the deep end, jumping off the diving board, eating a hot dog and French fries under the concession stand roof. It all comes back to me, like opening a book you haven’t read in years and remembering how much you liked the story. The French fries taste exactly the same. Jack likes going to town. He’s well-known at Morris Variety, and Michael at Sal and Vin’s always makes him look great. 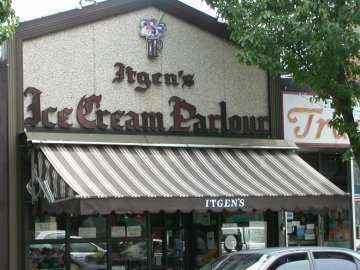 We recently had Itgen’s for lunch and Ancona for dinner with a trip to the pool in between. Jack and his mom both like mint chip ice cream. I’m a vanilla fudge guy. Ancona meatball parmesan heroes are sublime. This year, I made some new friends in my old town. While looking for dog parks for our new Labrador puppy, I found Envision Valley Stream, a group that promotes ideas for fostering a sense of community, including park clean-ups, graffiti removal and the skate park and dog park initiatives which the village administration has been receptive to. It’s nice to meet people of all ages and backgrounds who like living here. And it’s very nice to see the local government working with residents to make good ideas happen. Jack is going into second grade at Carbonaro School. It was a warm and nurturing place when I went there and it still is. This year, he played baseball with the Valley Stream Little League. I played on a Mail League team in the ’70s, so of course the “Whoosh!” brought me right back as I stood on the ball fields of Barrett Park, Wheeler Avenue and others. We marched with the Little League in the Memorial Day parade, my first since the ’70s. The sense of community here is as strong as ever. And a one-time reputation for intolerance has been replaced by a diversity of people who interact easily with each other. This is something my son will have which my generation did not. His big small town is a lot like mine, but better, and I’m glad we’re here. Ok, I’m back here in 2015. Christ, I’m tired. The Dude doesn’t go to Carbonaro anymore because the class where he fits best is across town in an identical building called William L. Buck. (The Dude calls the similarity “freaky”). We’re a long way removed from little league, and I’m a happy observer of the Memorial Day Parade. The Dog Park is a raging success, mostly due to the efforts of others besides myself, but I feel a sense of ownership of the place, and so do Mookie and his Dude. You’ve gotta like that. “Envision Valley Stream” is in the process of morphing into the Greater Valley Stream Civic Association, in which I’m trying to carve out the time to take an active role. (I’m the liaison for the “part of South Valley Stream that isn’t Mill Brook or Gibson even though Gibson built the houses but don’t you dare call it North Woodmere” -Our Man On The Creek, if you will). Yeah, we want out. And we more than likely will get out someday. We won’t be able to afford to stay when we’re too old. They’ll eat us alive. But for now, me and My Dude still go to the pool most weekday afternoons in the summertime. 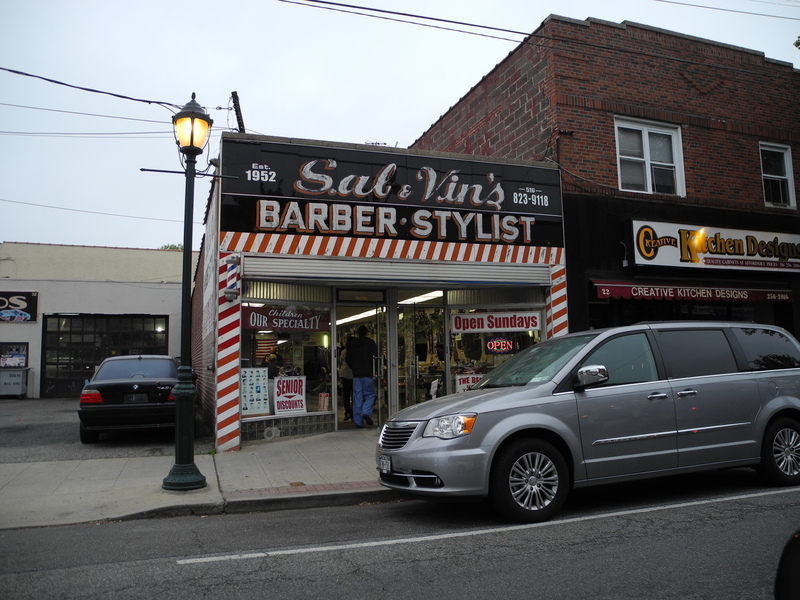 And we’ll be getting our haircuts at Sal and Vin’s tomorrow. And lunch or dinner at Ancona is never far away. (John! You Called?). When we finally do leave Valley Stream, when it’s all over, will I miss it? (I have to speak for myself, as Trisha has been here for 15 of her years and I’ve been here for all 52 of mine, more or less). Will I romanticize it like my mom did when she left kicking and screaming? I don’t know. Places are funny like that. It’s like the line from “Fast Times at Ridgemont High”, when the creepy guy is giving the dorky guy his dating advice: “Wherever you are – it’s the place to be! – Isn’t this great?” I tend to live in the present tense (which is why we’re broke), so if I were living upstate, I don’t think I’d give it much thought. I think the toughest thing about leaving would be the legacy that I’d be ending that started with my parents in 1955. My mom DID miss it when she left, so I’d miss it for her. Speaking of my Mom, if you’ve never met her, you’ll have a chance to get to know her a little bit in my next post. Anybody would tell you that would be your lucky day. And coincidentally, that upcoming post is also about a kitten who had a very lucky day because he decided to follow a big yellow dog one day on Duffy’s Creek. It’s not so complicated, but I’ll probably tell the story in a way to make it so. I got that gift from Mom. I’m long-winded and I need an editor. But at least I came by it honestly. Read it anyway, and thanks. See you when the tide comes in. 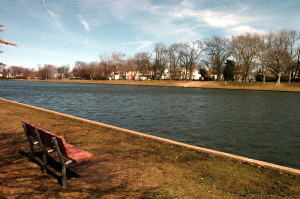 Hendrickson Lake in Valley Stream. I can’t take a boat on it and my dog can’t jump in it, but it’s nice enough to look at, and a good place for a bike ride or a walk. It’s the Crown Jewel of My Hometown, and it’s a just a couple of sewer pipes and a six-lane highway away from Duffy’s Creek. Loved the story we left Valley Stream in 2006 , lived there 33 years miss it and the friends I made and lost there over the years . Love that town was involved at the schools and at Holy Name of Mary . My boys went to Carbonaro and South . I worked in the HS District office. Yes things have changed but all things change over time some good some bad but when I go back to visit or to get a slice at Ancona… it brings all those memories back.